Hot Press has been greatly saddened to hear of the death of Michael Crowley, who passed away last night. Michael was the owner of Crowley's Musical Instruments in Cork, and has gone down in industry legend as the man who, in 1963, sold the distinctive 1961 Fender Stratocaster to Rory Gallagher for £100. Battered on occasion, and road worn from Rory's heavy touring schedules, the famous Strat was used throughout his long and illustrious career, and became Rory's trademark and talisman (pictured). Rory remained friends with Michael, who had a cameo role in Rory's celebrated film Irish Tour 74, directed by Tony Palmer. 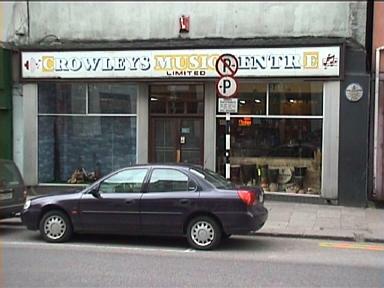 The shop, which is located now on MacCurtain Street – on which Rory also lived – remains at the forefront of music instrument retail in Cork and is run by members of the Crowley family. "He was a stalwart of the industry," Lesley Kane of KMI Distribution commented on hearing of his passing. "It was always a pleasure to deal with him." Michael will be mourned by his family – wife Pat, daughters Deirdre and Sheena (who run the shop), Fiona and Aideen and sons Tadgh and Michael – and friends, and by everyone in the industry, especially the Cork musicians young and old, to whose development he and the shop he established have given so much. RIP. A l'origine, Crowley's était sur les quais (on voir le magasin d'origine dans le film "Irish Tour" de Tony Palmer). 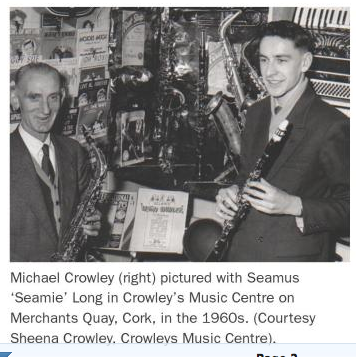 MUSICIANS in Cork have been saddened at news of the death of music shop owner Michael Crowley. Best known to the wider public as having sold Rory Gallagher his famous sunburst Fender Stratocaster guitar in 1963, he was well known and respected by music enthusiasts from Cork and further afield who visited Crowley’s Music Centre on MacCurtain Street for new instruments, repairs, sound equipment and many other services. The family business was started in Merchant’s Quay in the 1930s by his father Tadhg and his uncle Denis, who started out making and repairing uileann pipes. Some of Michael’s children are now involved in the running of the shop. Gallagher bought the 1961 Fender guitar that became the legendary bluesman’s trademark up to his early death in 1995, and was a frequent visitor to Crowley’s store during return trips to Cork. U2’s sound engineer Joe O’Herlihy, also a native of the city, put his talents down to training he received while working in the shop during the early 1970s. Michael died unexpectedly in the early hours yesterday at Cork University Hospital. He is survived by his wife Patricia, daughters Deirdre, Sheena, Fiona, Aideen, and sons Tadhg and Michael. His removal will take place on Monday evening from his home in Ballinlough to the nearby Our Lady of Lourdes Church, where funeral Mass will be at midday on Tuesday. "The story goes that Jim Connolly, a member of the Irish Show Band, originally ordered a cherry-red Strat and so, when a “sunburst” version arrived from Fender, he decided not to buy it." En fait, il y a confusion (confusion que l'on retrouve souvent, sur Wikipedia par exemple): Le premier propriétaire de la Strat n'est en effet pas Jim Connolly (qui fut le claviériste du showband The Monarchs), mais Jim Conlon, guitariste du Royal Showband, un showband de Waterford très populaire à l'époque. 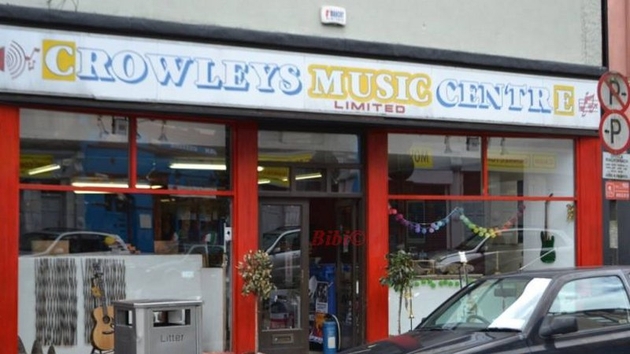 CORK’S music scene is set to hit a high note with the reopening of the iconic Crowley’s Music Centre — the institution that sold Rory Gallagher his famous sunburst Fender Stratocaster. In business since 1926, it will reopen on October 13 upstairs at the Oliver Plunkett Bar in the city centre, after its premises on MacCurtain Street closed just over a year ago causing major upset. The business was started by renowned piper and pipe maker Tadhg Ó Crualaoí, who made pipe band instruments in Merchant’s Quay 88 years ago. Tadhg’s son Michael later took over the running of the business. He passed away in 2010 and the legacy was carried on by Michael’s daughter Sheena Crowley, who was devastated after being forced to close in August 2013 due to what she described as changes in the nature of the music business including a shift to online purchasing of musical instruments. “When the store closed it was overwhelming and devastating in equal measures but it didn’t really feel like goodbye,” Sheena said. But despite this, Sheena said it was still extremely difficult to remain hopeful. It was the memories of her father’s own dedication to the store that kept her going. Sheena spoke of how the store brought her closer to Michael. Sheena said she is delighted to have the opportunity to set up in such a prestigious music venue. “There were a lot of people who approached me with ideas of how I could reinvent the business. When owner of The Oliver Plunkett, Paul Montgomery suggested that I set up in the bar it felt like a good fit. He had initially approached me to set up a Rory Gallagher tribute corner which I absolutely loved the idea of. It was then that he asked me if I wanted to avail of space for the store. I’m looking forward to seeing the business evolve into a meeting place for some of Cork’s most talented musicians as well as a music store. Crowley’s Music Centre’s new set up will have a stronger online presence and focus mainly on vintage instruments and musical accessories. The shop’s launch will take place next Tuesday at 8pm in the Oliver Plunkett ahead of it reopening in October. Çà c'est une p*tain de bonne nouvelle !!! En principe et si Dieu le veut bien j'irai faire un tour là-bas l'année prochaine !!! 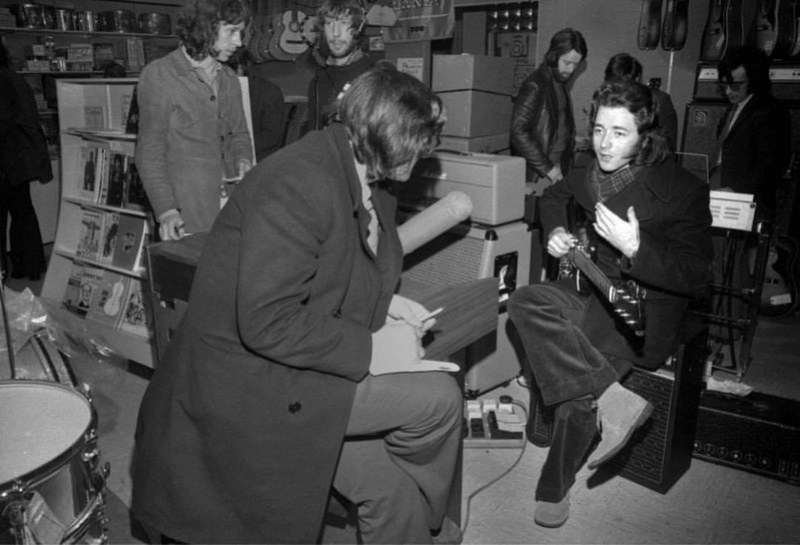 Rory being interviewed in Crowleys music store, Cork in 1974.